Mariana Fataccioli is a food, health and wellness blogger who has the impressive claim to fame for having amassed a following of 100,000 people in 6 months on Instagram. She has also pulled off the considerable feat of making $100,000 in her first year of business. At the time of the interview, Mariana’s Instagram following was up to 370,000 people! This is no small accomplishment given that many bloggers are still winding up to making basic sales in the first year. Mariana explains that most of her income was poured back into her business to continue growing it, so she’s still deep in the trenches working on taking things to the next level. Mariana grew up with a very entrepreneurial mom. Her mother currently owns and runs three businesses so Mariana is no stranger to the work and hours involved in being an entrepreneur. Mariana saw how hard her mother worked, some days from 6am to 1am the next morning to manage the business and care for the family. Because of this, Mariana was adamant from the beginning that she wanted to create some kind of systemized business. She wanted something that she could step out of and work on, instead of in, every single day. Mariana’s background was in the fashion industry so she began her first blog on fashion. Whilst working an internship for Harper’s Bazaar magazine, she found herself managing the other interns within the first three days of starting. By the end of two weeks she had moved ahead so much in her role that she felt she needed to go out on her own rather than continue working for someone else. Mariana wanted to stretch herself beyond any limits that would be set by being stuck in a prescribed job. Over the next few years she began to find inspiration from her own personal health journey. This became fuel for Mariana’s online business, Skinny Kitchen, as she shared what she was doing on her Instagram and people began to respond and connect with her. Like many of the entrepreneurs I’ve interviewed, Mariana taught herself how to do everything from searching on Google. If she had her time again, she tells me that she would definitely outsource most of the work rather than try to do it all herself! I asked Mariana how she grew her massive Instagram following in such a short time. Mariana found the big jump came from other people tagging their friends in her images and asking them to make the food she was sharing in her Instagram photos. She also had a system of using 30 hashtags with 20 regular tags for all of her posts then leaving space for 10 hashtags specific to each individual post. A significantly powerful element to Mariana’s Instagram success has come from sharing other people’s Instagram posts as well. By doing this, she built a strong community because people kept sharing more and more of her content when she included them in her posts. Because her Instagram following is so strong, this has been the primary traffic source back to her blog. Within 6 months of blogging, Mariana set up her online store using $3,000 she had saved up. She used Instagram to do market research to see what people would be most likely to buy. Her sleuthing work paid off and she sold out of all her products within the first day and a half of launching her online store! Nowadays Mariana has such a strong following she has numerous brands approaching her to advertise on her social media channels. She has got a lot of plans to keep expanding her business as the year progresses. Remember that hashtag is king when growing your Instagram following! Mariana says to find out what the top 20 hastags are for your industry and just keep posting every few hours, every day. If that sounds overwhelming, it doesn’t have to be new posts all the time. Mariana grew her audience by sharing other people’s posts and creating relationships with them, and reposting some of her own posts at times. 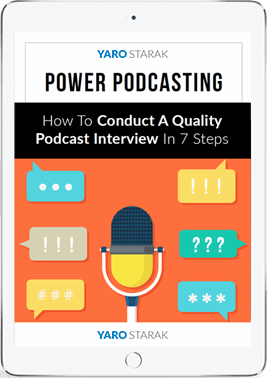 To find out even more tips and get the finer details from our conversation, tune in to the podcast recording or check out the transcript. Thanks for joining me and enjoy the interview. Really interesting interview and story. As a fellow health eCommerce business owner, I definitely agree with Mariana’s thoughts on Instagram as a marketing channel. Our business SupermixME @supermixme (www.supermix.me) gets most of it’s traffic from Instagram, and is extremely high converting. Instagram appears 90+ times in this article – Which one is the typo? I wouldn’t call someone a health food blogger as there are only 3 articles on the Skinny Kitchen website – it’s more of an online store, not a blog. You’re right, she is more of an instagrammer, which is how she built her audience too. Hey Yaro, loved the interview (as always). I was a little confused by the hashtag process Mariana utilises for Instagram. I understand she’s using 20 standard and 10 post-specific hashtags per post, but I didn’t understand what she meant by having the hashtags in the comments section as well. If you or Mariana could enlighten me that would be great. Got it, thanks Yaro. I’m still not convinced by the logic of having hashtags in the comments (as opposed to having them in the post), but I’ll test this to see what difference it makes. Loved this episode by the way. I think I’ve listened to every EJ podcast since you interviewed Shoemoney way back in 2009. Out of interest, what happened to podcast you were doing with Walter? That was an awesome show. Glad to hear you like the podcasts Martin! I’m not sure what the difference with the comment hashtags are other than perhaps you can place more of them in there over the 30 limit? Walter and I paused the podcast when he went traveling around Europe for three months late last year. We never restarted it after that because it was at the bottom of a list of priorities for both of us unfortunately. For what it’s worth, I sincerely believe that your podcasts are better than ANYTHING else on iTunes. Love your work. You’re a man amongst men. Making $100 000 in sales is great – but It would help a lot to know what the actual profits are. Yaro do you know what the profit margins are in an online store like Mariana’s? It would be helpful to know the true figures for those aiming for physical products in an online store…. I don’t know her margins, but as you heard she puts the money back into buying more product to grow the business so she’s probably not keeping any profit at the moment. I suspect the margins are around the 30-50% mark for physical products as is the case for much of retail. This is why I love info products – such good margins! Very interesting how she did 100k. I guess all money come from paid articles and maybe affiliate sales through Instagram, but not through website. Beacause website is dead now with terrible UI design. The website is not dead for me, and the store works fine – lots of food products listed there you can purchase. That’s huge fan following indeed, crazy stuff. I love listening of entrepreneurial people at that young age! Great finding, Yaro! I particularly like the specifics how Mariana achieves such a high amount of followers, potential customers for her online store/blog, by using Instagram. I think the ‘old school’ (by age, or by being long time into a blogging, but with no success) should definitely listen to this story – there’s lots to learn how younger social media users achieve high volume of followers! Besides, for me this story is a great example of an entrepreneurial spirit! No matter the age, the spirit within, having a clear ‘vision’, as Mariana says, that’s the great power within we all (trying to achieve our own thing by ourselves) can consciously embrace as a model. Thanks for that down to Earth, but highly inspiring interview, Yaro! Simply loved your article. Thanks for sharing.